‘Controlled time is our true wealth,’ the American architect and engineer Richard Buckminster Fuller once said. In our day and age, this somehow rings true to those who are perpetually overworked and seem to have no leisure time to themselves. But when you sit at Soi 60 Restaurant and Bar, you cannot help but feel that you are surrounded by wealth. While the well-appointed serviced apartments loom in the background, people stroll idly by on the banks of the Singapore River, and others have afternoon drinks in the bars which line the footpaths while some sip afternoon drinks with their friends, simply enjoying the beautiful indulgence that is leisure time. As far as Thai restaurants go, Soi 60 makes you think of the street kid who made it in life and is now living the life. His tastes haven’t fully changed, but he has cleaned up a fair bit. Everything here is gentrified, from the chic and modern décor, to the chill-out lounge music playing in the background. Seated at an alfresco table on a Saturday evening, enjoying the breeze and great ambience, you can’t help but cast your worries to the wind. A look at the menu lends credence to this sentiment: the number of pages devoted to wine and liquor was greater to the number of pages devoted to food. The message was undoubtedly clear by now: this restaurant is all about the experience, good food was only one component of that experience. In spite of the impressive wine list, a particularly crisp German pilsner stands out, Bitburger. It is on tap, and goes well with Thai food. The Pork Skewers for starters were generously-sized and glazed in a sweet and sticky satay marinade, with glutinous rice on the side. The nice grill marks on the lean, yet tender, meat is the giveaway sign of expertly grilled meat. Dipping the pork into the sweet and tangy chilli sauce distinctively accented by fish sauce, it was a combination of intense flavours. The glutinous rice was a good temper to the sharp and piquant character of the sauces. The crowd-pleasing Green Papaya Salad was salty and tangy, and was garnished with parsley and whole roasted peanuts for a heartier crunch than crushed peanuts can afford. The green papaya was fresh and its clean flavours made a nice counterpoint to the sharp and pungent flavours of the dried shrimp, lime juice, and fish sauce. Next came the Green Chicken Curry. The curry gravy was smooth and creamy. No doubt, a lot of coconut milk went into it. The smooth texture was rather necessary as a backdrop to the fork-tender chicken. Moist and succulent, hardly an ounce of effort was spent stripping off every morsel of meat from the bones. White rice is a rather necessary accompaniment to this dish, the better to soak up more of the addictive gravy. Having said so much about the classic Thai Green Curry at Soi 60, I prefer my own home-made version. My dad makes a green curry paste using a recipe from his mother in Pengerang, southeast of Johor. Before adding the paste to the hot pan, I fry some cumin, fennel, kaffir leavesand lemongrass until fragrant. Then I add the curry paste then tamarind juice then meat. So you see, we use tamarind juice and Soi 60 uses coconut milk. I prefer it bold and wild while Soi 60's version is mild and and tame. The other main course was Wagyu Beef with Green Peppercorns. The tender and flavourful slices of beef was stir fried with green peppercorns (not black, so the flavour of pepper wasn’t at all overpowering nor dominant), fragrant basil leaves, and a thick and tasty fermented bean paste-based sauce. Seriously tasty stuff, it really is enjoyable chomping on the beef. By now, you may realise something which is so obvious that it stares you in the face: the food is not even spicy. If you had gone to a normal Thai restaurant, heck, even a roadside eatery in Bangkok, you would be feeling the effect of the chilli padis the Thais love to put in their food, but there was none of that here. See? Gentrified. The use of Wagyu beef in a stir-fried dish was another corroborating detail of this theme of gentrification. Had it been a normal Thai restaurant, regular lean beef would have been used. 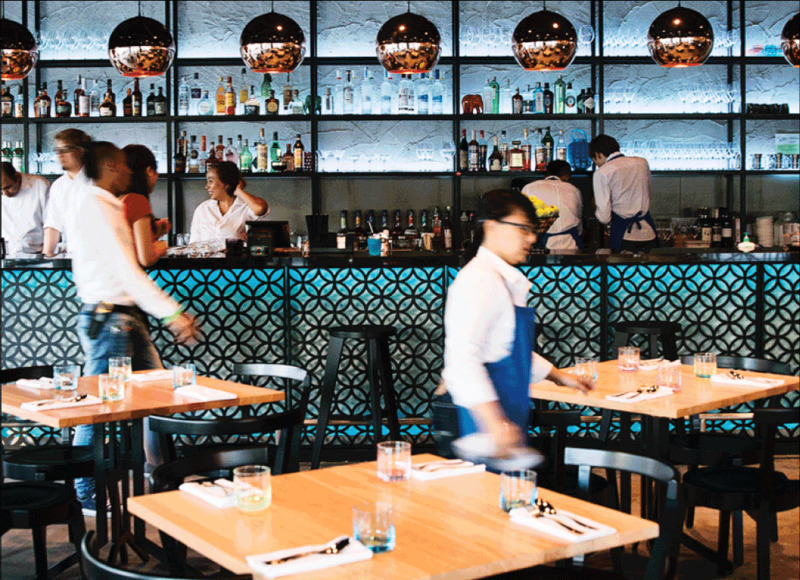 Though unmistakably Thai, the food had some rough edges sanded off and polished with lacquer. The desserts made a big impression. The Banana Fritters were served in a crispy batter, sprinkled with sesame seeds. Accompanying it was home-made chocolate ice cream and home-made coconut cream, laced with home-made salted caramel. The ice-cream was rich in cocoa, not sweet, and had a very smooth texture. The coconut cream was savoury, smooth, and rich. When every part of the dessert was taken together, it made for a layered, delicate, symphony of tastes. The home-made accompaniments are particularly impressive. The Tapioca, on the other hand, was much simpler to enjoy: a seriously guilty pleasure. Unlike what was anticipated, pieces of steamed tapioca with sweet coconut milk, it was a deceptively simple, now-why-didn’t-I-think-of-that kind of creation. Picture a pudding of sago (made from tapioca flour, hence the name of the dessert); morsels of pineapple, jackfruit, and lychee; all that doused in palm sugar-sweetened coconut milk. These two treasures, comfort and leisure, are the essence of the experience at Soi 60.